In Part 1 of this series I wrote about the event in general and about Sushi making with Chef Nobu. 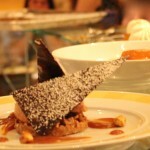 Part 2, focuses on the grand tasting event and this is Part 3, Pastry Making with Chef Francois Payard. 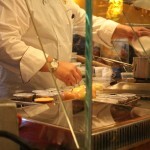 Chef Payard is one of the most warm and welcoming chef’s I’ve met. His unassuming sense of humor made his presentation engaging in addition to being educational. 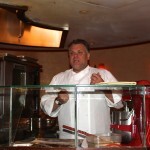 This was the first VegasUncork’d event where I walked away feeling like I had learned something I would apply to my cooking/baking. For Chef Payard, it’s all about the small things. The precision with which he bakes demonstrates that motto. 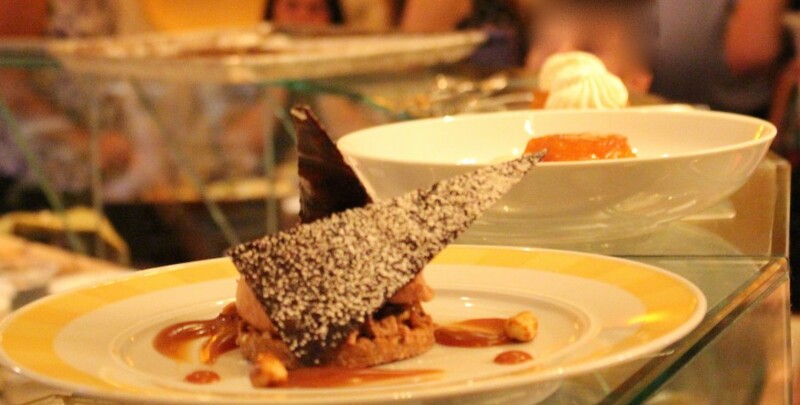 The order in which you add ingredients, the tools you use to prepare a dessert, the care with which you present the final product, it’s the small things that lead to perfection. One tip I picked up was when to add citrus to other warm ingredients. In order to prevent certain ingredients, like milk, from curdling or going bad, you wait until the mixture is cool before adding lemon or other citrus. I had never though about that before. The goal of Chef Payard’s workshop was to ensure that participants walked away having learned something, he’s all about eduction. With that being his goal, I can say that he was successful! Chef Payard showed us how to make an Apple Tarte Tatin with ice cream; Rice Crispy, Milk Chocolate Phyllo and Chocolate Chantilly with Caramel Sauce and nuts; and Hot and Cold Pina Colada. The workshop was very interactive. In addition to the presentation, samples of many types of desserts, including the ones we were learning to make, were served. There were delicate macaroons and macarons – yes, that’s right, there were the soft, chewy coconut macaroons and the light almond pastry that has become the newest craze at bakeries. There were dozens of chocolates, cookies and cheese on savory breads. 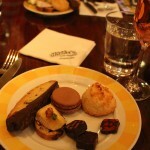 Champagne and dessert wines were also served to complement each of the deserts we learned to make. The event was not only educational, but it was fun. We were able to take photos with Chef Payard and got autographed cookbooks courtesy of Chase Sapphire Preferred. Along with the cookbook was a black tote from Herschel filled with a box of chocolates, a whisk and recipe cards. 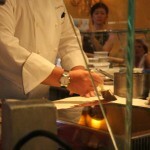 The Nobu experience was completely different from this pastry making experience with Chef Payard. Both were wonderful and unique but pastry making was much more interactive and practical. I’ll never make sushi, but I will be making some perfect caramel sauce! I will continue to enjoy Sushi at Nobu restaurants around the world and will use the Payard Cookbook to whip up some of my own treats. I would highly recommend participating in VegasUncork’d 2015 and if Chef Payard is on the agenda be sure not to miss his presentation! 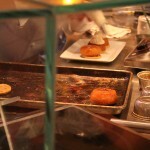 2 Comments on "VegasUncork’d: Pastry Making With Francois Payard"
Stacey, it’s great to see your blog. 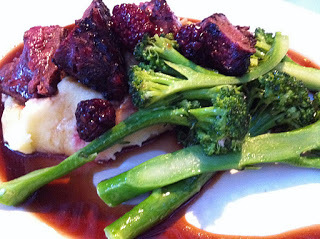 I remember you telling my husband and I about it at Chef Payard’s class. Such a great event too! Hope you are well. So glad you found me! What a great event that was. Have you had the baby? If you guys end up there next year, let me know!